established at a historically black college. Just, who would eventually become a world-renowned biologist. rights activists Jesse Jackson, Roy Wilkins, and Vernon Jordan, former U.S.
Basie and Max Roach, and athletes Michael Jordan and Shaquille O’Neal. scholarship and uplift among African Americans. evolved into Black History Month. undergraduates in various institutions across the nation. 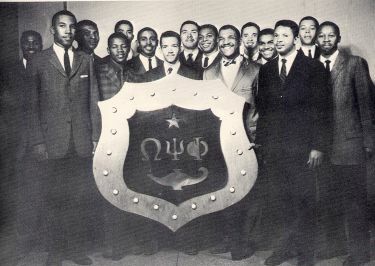 Lawrence C. Ross, Jr., The Divine Nine: The History of African-American Fraternities and Sororities in America (New York: Kensington, 2000); Daniel Soyer, "Fraternities and Sororities," Encyclopedia of African-American Culture and History (New York: Macmillan Library Reference, 1996); Omega Psi Phi Fraternity, Incorporated, 2007, http://www.omegapsiphifraternity.org/.